100% of the UK's top engineering companies use SuperSUITE software! 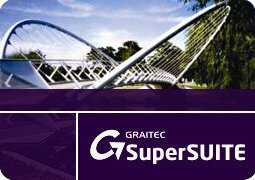 Graitec's market leading SuperSUITE has been designed by engineers for engineers, to improve productivity in modelling, analysis, design and detailing for bridge and structural projects. SuperSUITE is the umbrella term given to Graitec's modelling and structural analysis software. What makes this software unique in its field is the innovative way in which the user interface is designed; making SuperSUITE quick and easy to adopt. Our Customers confirm that ease of use is key to the unmatched success of our core analysis package - SuperSTRESS. Formerly Integer Software, the team have over 20 years of experience and an unparallelled industry reputation, product range and support team that assist a full range of clients from small engineering firms to global consulting organisations.